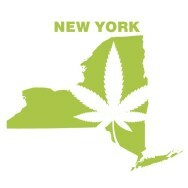 According to new polling, a strong majority of registered voters in New York are in favor of legalizing cannabis for adults. The poll, conducted by Emerson College and commissioned by the Marijuana Policy Project Foundation and the Drug Policy Alliance, found that only 28% of New York voters are opposed to cannabis legalization. With 10% unsure, even if all of them decided to start opposing legalization supporters would still have a 24% majority. The poll also found that 60% of respondents support legalizing and taxing marijuana to help address New York’s budget deficit. Between 15% and 27% of voters supported each of the other options presented — increasing sales or income taxes, increasing tolls, or cutting public education or other services. If you are a New York resident, you can email your lawmakers and Gov. Andrew Cuomo by clicking here. The post Poll: 62% of New York Voters Support Legalizing Cannabis appeared first on TheJointBlog.